Have you heard of Instagram, the cool and easy to use photo app for iPhone which allows you to add interesting filters and share your photos online? Did you notice some really lovely and creative photography popping all over the social network this month? Well, blame it on Chantelle from Australia! 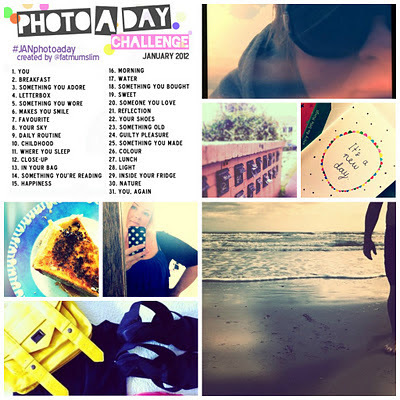 Thanks to FatMumSlim blog, we can all be creative and share little piece of our life with this new photo challenge - take a photo a day based on a list key words. I love the idea! It's a bit late for me to jump on the wagon for January but the good news is... A February challenge has just been released due to the success of January. I usually take photos with my phone everyday but I like the theme idea, it helps to get me out of the comfort zone and to capture our everyday life in a more unique ways. Will you join the fun? I will keep you posted and share with you my progress. Desert Safari Dubai is the one of bet place in UAE .It is marvelous location for trip. Dhow Cruise in Dubai is great place to have Dinner.